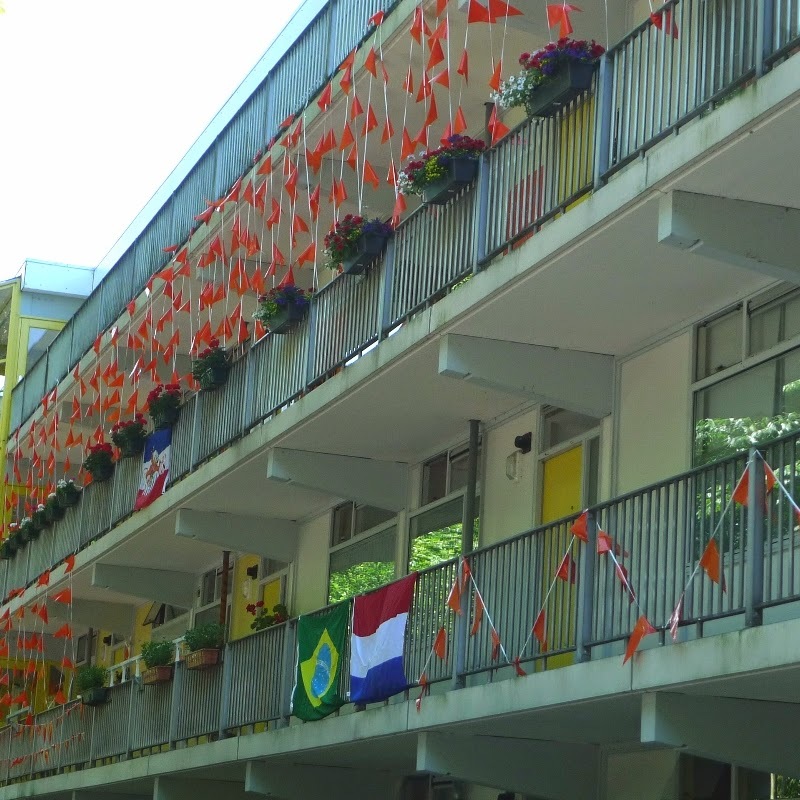 Some time in the course of the 2010 World Cup, I looked out of the window of my dad's flat in Holland and spotted, right on the parking lot, a diminuitive Volkwagen up!, all decked out in orange and with the works "up! Holland up!" painted down its sides. I grinned. It was a brilliant marriage of the name of Volkswagen's tiniest car, the up!, and the fighting song of one of Europe's smallest nations. Very much tongue in cheek, it goes, "Hup, Holland, hup! Don't put the lion in its undershirt." It is sung in the key of good nature, by supporters of Dutch teams at international sporting events. Some duke, Floris III of Holland, had the lion put on his shield in 1162. Back then it looked fearsome, with blue claws and a blue tongue. These days a fan-friendly version of the Lion of Holland is sported on the orange mini-flags that are strung across Dutch streets by residents taken by football fever, together with the red, while and blue of the flag, the whole remaining very much out in the cold and the squalls of driving rain that tend to grace Dutch summers. Really. How can you take a team seriously when its anti-mascot is a lion shivering in its undershirt? It's the same way Europeans prefer their car ads: the more tongue in cheek the better. There are tons of them on YouTube: light-hearted ads that poke fun at the cars or their owners. I assumed the "up! 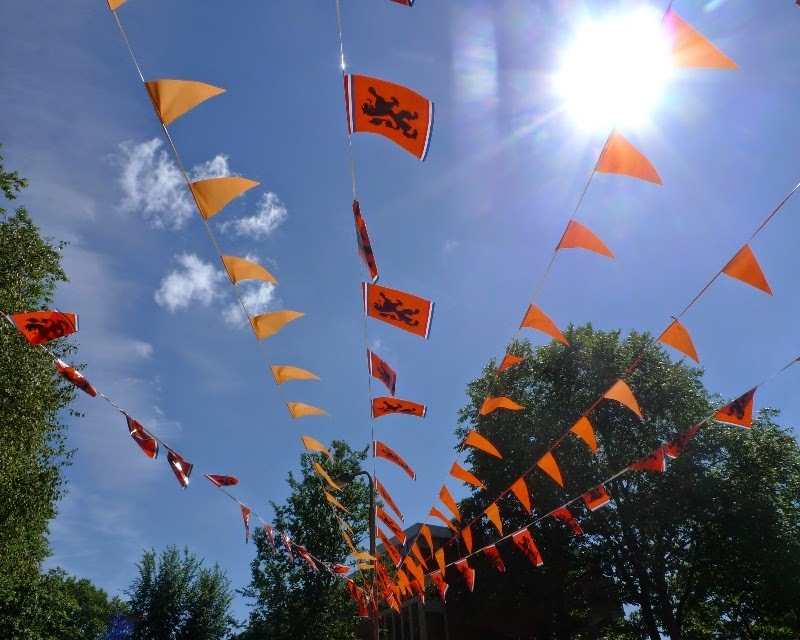 Holland up!" slogan would be used for the 2010 World Cup, and was surprised to see it in an ad for the 2012 Olympics, which took place in London. The ad campaign was called "Orange Motion", a pun on Volkswagen's high-fuel-efficiency BlueMotion option. "Cheer yourself to the Games - in the first Volkswagen up! that runs on sound". One can only hope no babies (or dads) were harmed during the making of this ad. 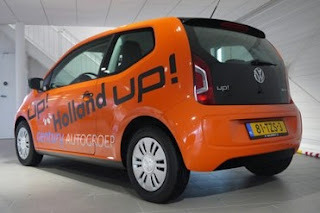 Perhaps in a kick at Tesla exclusitivity, Volkswagen selected the tiny up!, a real city car, to receive one of its first electric drives: Check out the e-up! Which will be followed by the e-Golf, starting in 2015. EV enthusiasts rejoice: apparently this one is slated to come to the US. Range: 113 miles.